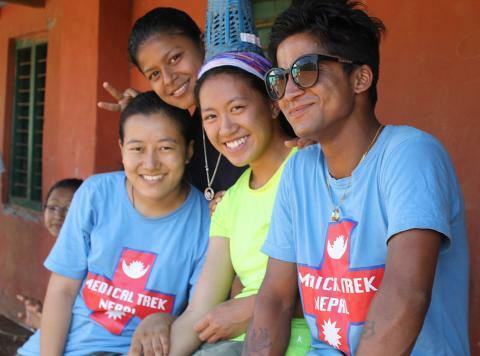 Medical Trek Nepal is a unique trekking experience where you volunteer in medical camps in remote regions of Nepal. Most of our volunteers for this trek are medical professionals and medical students. However, we welcome spouses and friends who are non-medical to help in our camps on this trek. On this 14 day itinerary, after your orientation days in Kathmandu, you will head out to a remote region of Nepal (well off the beaten tourist paths) to villages where people are in dire need of medical care. In most of the remote villages it is a few days walk to the nearest medical outpost, and even those are seldom manned with permanent doctors and nurses. You are your fellow volunteers will spend 10 days trekking and setting up camps to serve these villagers. Your trekking fees help pay for a moving pharmacy that is free for the villagers, along with all the needs of a highly supported camping trek. You will be going with Nepali medical translators and guides, along with a cook and porters who will help you enjoy this camping trek to places in Nepal that most tourists never see. 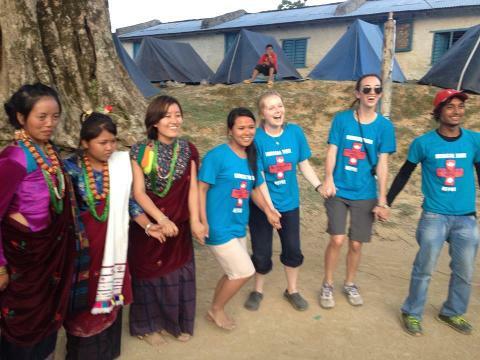 Our Nepali nurses will help you communicate with the villagers and assess their medical needs. We see many elderly and children on this trek… They love our volunteers and our grateful for your presence in their village. 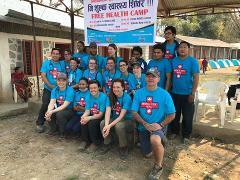 Medical Trek Nepal helps around 1000 people on each trek. If you are a doctor, nurse, EMT, or student, we would love to have you help us while you enjoy trekking through Nepal’s most beautiful wild regions. Our team provides you support from the moment you join this trek. Before you leave for Nepal, our team in the USA office answers all of your questions and helps you prepare for this trek. If this is your first trip to Nepal, we know you will have a lot of questions. Starting at 90 days prior to trekking, we send out monthly newsletters with information about preparing for your trekking in Nepal. Once you arrive in Nepal, you are picked up by our Kathmandu based team, and transported to the hotel we use for each trek. 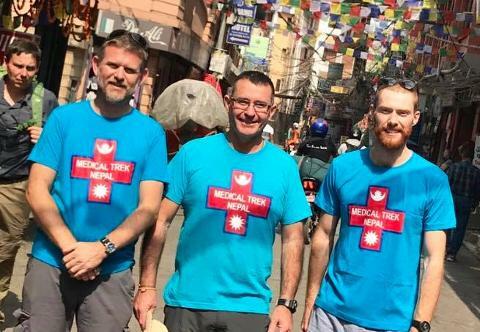 The Nepal team takes care of everything you need for 14 days including ground transportation, most meals, and securing permits required for medical volunteering. On trek, your porters and sidar provide for all your camping needs. You will be accompanied by an expert Nepali trekking guides, our medical coordinator, a local doctor, and a medical translator (usually a nurse). This trek exists to support the people who have the least access to roads, technology, and basic services. Our camping crew makes you as comfortable as possible, but expect this to be a rugged trek with minimal facilities. Most villages have one or two squat toilets and a water tap available near the school house. We will set up tents in this area on the edge of the villages. 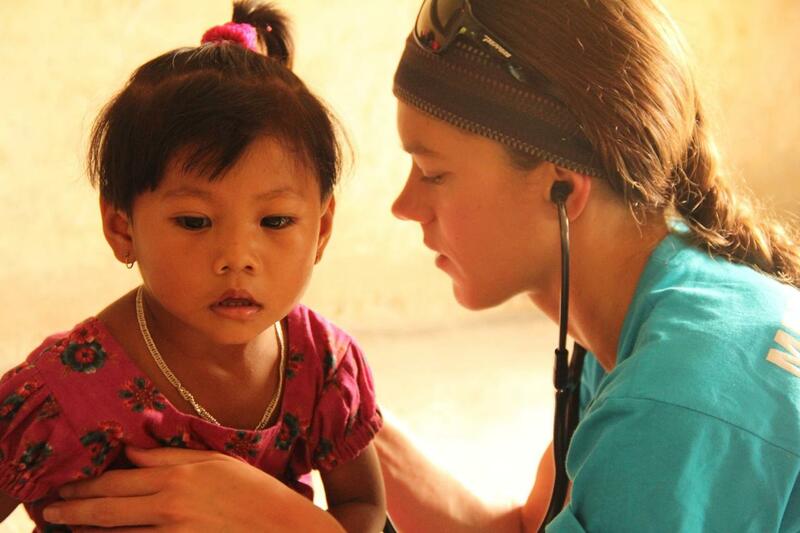 On days we are not providing medical care, we will trek 5-6 hours to get to the next villages. You can expect one day of average to strenuous hiking, then one day of a very busy medical clinic alternating throughout the trek. Your reward for a hard days work? The evenings are usually filled with campfires, drumming from locals, and the occasional cultural dance show as each ethnic group is proud to show you their specific culture. Nepal has many, many ethnicities and our medical volunteers have been treated to Gurung, Magar, Tamang and other cultural dancing and music. Evenings filled with a fun as you recount the day with your fellow medical trekkers, and a healthy meal served up by our amazing sidar (cook). Education Experience: You will learn how to practice field medicine with only the basic necessities and no technology. You will see endemic diseases to this region, and some that have been eradicated in the west (such as polio). Occasionally our doctors come across an ailment for which they have no knowledge or familiarity. These we treat the best we can. A few docs have take photos to show to their colleagues in their home countries, but to date, we have not heard back that they have named the disease. You will also learn about Nepal lifestyle through this cultural immersion experience. Find out why Nepali people are some of the world’s strongest, most agile climbers and athletes. In these life changing 14 days, you will learn a different sense of time, and how less ticking of time is healthier. You will likely have a new outlook on life, and the way you approach medicine.